It used to be that every year Brian Young (with the help of Junichi Yananose and, of course, Mrs Puzzle, Sue) produced a limited edition puzzle which over the years have slightly increased in number. 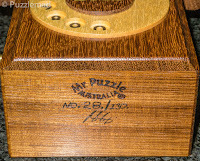 For the last few years the pressure of producing a stunning high quality original puzzle of ever increasing complexity as well as all his usual work and also the commissions for the exchange at the IPP has meant that the schedule has slipped a bit and the limited editions have ended up every second year and often with a long waiting list. I have to say that with the incredible complexity of the last few I understand the delays completely. The puzzle addicts all over the world were waiting with baited breath to hear of the latest LE release after a couple of teaser emails and we were not disappointed when we were informed of the availability of the SMS Box sequential discovery puzzle on 24th June this year. The biggest surprise was that Brian and Juno had decided to produce 130 of these monsters so that pretty much everyone who wanted one would be able to get it and not be disappointed. The other surprise was the price - at $850US this is not for the fainthearted and only for the seriously addicted puzzler. When the email went out that they were available I followed the link, drooled over the description, sat back in awe at the price and then, after a mere 10 second hesitation, clicked on the buy button. 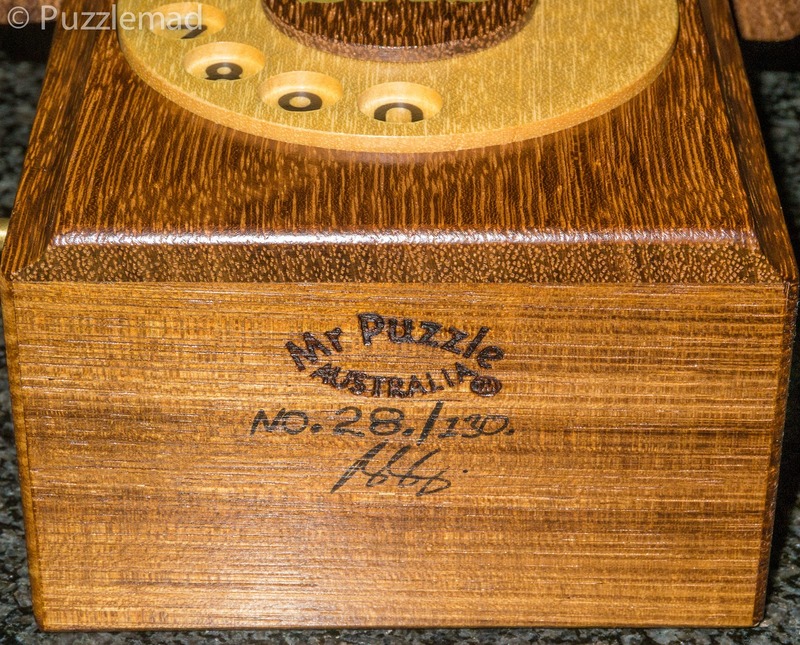 Brian and Sue are not out to fleece people - if a puzzle is this sort of price then it is because it is unbelievably complex and incredibly well made. My trust in the pair of them is implicit - if they are charging that amount of dosh then this puzzle was going to be worth that amount. If you are not sure then take a look at Allard's write up to see whether he agreed. Spoiler - he did! How is it possible to receive an SMS with this old telephone? That is the goal of this puzzle. To do this you will need to open more than one compartment in the SMS Box. When you can read the SMS you'll know that you've solved the puzzle and found all the compartments. All locks (and there's a lot of them!) in the puzzle are manipulated and solved with tools provided. Even though there are lots of magnets and springs you don't need to hit anything or use any external force. There are many tools provided to solve the many stages along the way and there is a tool for everything. No external items are required or allowed, so no raiding the office or kitchen drawers! Unlike Katie Koala or the Opening Bat these tools are much more difficult to recognise and you'll notice at the end of solving you won't have anywhere near the same number of small pieces. The smallest piece that is removed from this puzzle is about the size of a micro sim card. Certainly there's no shortage of magnets, springs and other small moving parts inside the puzzle, it's just that they are not removable. The puzzle has some deliberate booby traps built into it so even when you think you're on the right track you may have been going up the proverbial garden path. If you're into mapping puzzles another puzzling element will be to understand the booby traps themselves; a. To stay away from them and b. To work out how to get back out of them. When the first prototype was finished Brian and Juno looked at several aspects of the puzzle and decided they were ridiculously hard so they went to great lengths to make the solutions to different steps more straightforward and consequently more elegant. Having read this, I (and all of you) should be warned - Brian said the tools are much more difficult to recognise and also that this time he had placed booby traps. 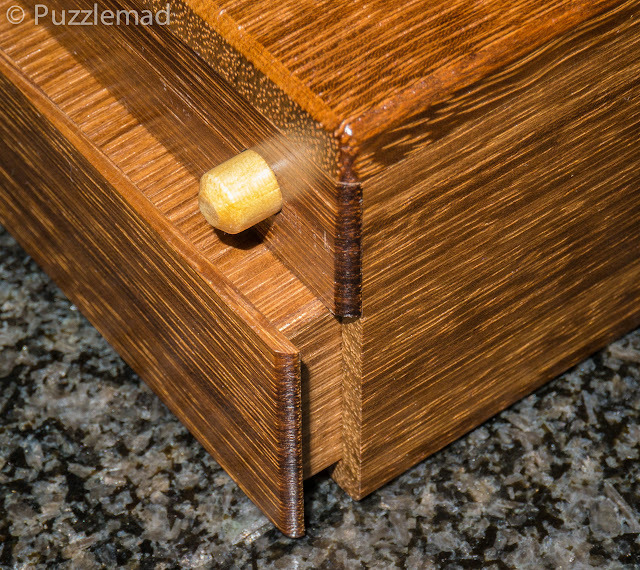 He's not kidding - this is probably the toughest puzzle currently available in the world! The frightening thing is that having backed off the difficulty a bit from "ridiculously hard" he has still produced something that is simply OMG hard! I hope to God that he never really lets his imagination run riot as one day he may kill one of us! After placing the order I informed the present wife that she had just bought my birthday present rather early, I breathed a sigh of relief when she didn't ask the price. In fact to this day she hasn't asked but she knows that it is "reassuringly expensive" and worthy of the "special birthday" that has just passed. Brian was making them in batches alongside his other work and the interminable wait began. In July my usual number 28 arrived and Mrs S suggested that she keep it until the end of October for my birthday. This time I was so flabbergasted by that thought that I actually developed my own lazer burning stare and she backed down - amazing!!! After I opened all the packaging, my initial thoughts were that this was big and heavy and beautiful. Little did I know the torture that was about to begin. Previous LE puzzles have provided anything from a few days to a few months of puzzling fun but I have usually gotten to the end eventually. This puzzle however, was going to be more than my match! Shane had also bought it and received his a few days before me and we had discussed a joint solve where we help each other along. I have done this quite a few times with him and am very happy to surf along on his very talented coat-tails. He seems to be convinced that I am a good puzzle solver but most of the time he solves it with my moral support and then tells me what to do. The process is just as much fun for me despite my inability to solve the puzzle alone. The box is 150 x 105 x 68mm plus the handset on top and looks stunning having been made from Queensland Blackbean with the dial made from Queensland Silver Ash. It looks just like an old fashioned dial telephone that I grew up with complete with nice handset. The dial even rotates! The first thing I noticed was that one of the receiver buttons on top was caught in the depressed position and had a tiny bit of movement but would not come up and then that the cord for the receiver can be pulled out of the hole in the side of the box (having been held in by a magnet). Using this magnet it quickly becomes obvious that there are other bits of metal and magnets of varying strength hidden inside the box. The next discovery after a few more seconds is that the dial tilts as well as rotates. After that I got stuck! Yep! I had made a few easy discoveries and then got no further at all for several days. Brian definitely had produced something tough. Dare I say it? "I got it up!" A small group of us were sort of chatting about it by email and a picture filtered through to me that there was a way to get the second receiver button to rise. How did that happen? I tried everything I could think of and whilst idly playing one evening in front of the TV, it suddenly came up and could be taken off. I had no idea what I had done so I put it back and clicked it back down into place and.....I was stuck again. It took me another 4 days to work out what the very specific and very accurate sequence of moves was that released the receiver button. Now I had another tool....what do I use it for? I had no idea because it wasn't really much of a tool. I was able to use it to make things change inside the box but could not establish what effect I was having. Again I was stuck! Most of the puzzling world got to this point and were all stuck. There was a rumour circulating that a certain puzzling giant (he makes big Steve look diminutive and me look microscopic) from New Zealand had actually solved the whole thing (or nearly done so) without any assistance at all and this gave me some heart and I set to with fresh hope. After a few days more of getting nowhere I was contacted by Carsten Elsäßer with a problem - he had been a bit further along in the solution than me and seemed to be understanding the interior more than I was. Somehow he had managed to get to the point where everything inside had locked up. After a bit of a discussion which was difficult when I had no idea how the puzzle worked, we established that he needed to send his phone back to Brian for investigation. For the next few weeks, I and everyone else I knew of, made little or no progress. At that point Brian sent out an email warning of a particular thing we MUST NOT do as it can cause the interior to lock up (as had happened to Carsten) he also gave a sequence to follow if that was to happen. I feverishly checked my box and breathed a sigh of relief that I was nowhere near that state - in fact I had done almost nothing to the mechanism of mine. A couple of weeks later (after the IPP) Sue sent out a pdf with the first part of the solution to the puzzle. It was all beautifully set out so that the stuck puzzler could get help with just the stage he was stuck on without ruining the next stage for him. With a certain degree of shame I started to read through the opening of the first lock within the box and sat back with a mix of awe at the ingenuity and utter horror at what he had expected us to deduce! There was no way on earth I would ever have managed to do that by myself! Even with instructions it took me a couple of attempts to achieve what was required. There is a real satisfaction when after carrying out that sequence this is a soft click from inside and a panel slides out. I have a picture of this below - it doesn't give away very much but only click it if you are happy to view a teeny tiny spoiler. First compartment open? Hell no! That's as far as it will go! Aha! and......oh no! The panel slid out but was stuck at about 1cm! Now what do I do? I spent a whole week trying to make it open further before resorting back to the pdf. OMG! I would never have done that either! I was beginning to think that I was not cut out for sequential discovery puzzles. I finally had the first half of the SMS box solved and I had barely managed any of it myself. Brian and Juno, you are a pair of evil geniuses! That is a simply amazing mechanism and in retrospect I can admire it even if I cannot see it. After the first half of the solution had been followed I had the box in 2 pieces but no idea what to do next. It only took me another few minutes to make a discovery and part of the reason for the name of the puzzle was revealed. I had another "thingy" I could use and even a place where it should obviously be used but nothing would happen. I tried inserting the "thingy" into the "thingy receptacle" in every orientation I could think of and tried rubbing my tummy and patting my head at the same time much to the amusement of Mrs S. I then tried using other bits of the puzzle alongside the "thingy" and "thingy receptacle" with still no further luck. By this stage Mrs S was openly laughing at me and I was beginning to feel rather ridiculous. Shane, in the meantime, had managed to solve it and taunted me with a picture to prove it! He's just so much better at puzzling than me! Sob! After another month had gone by Sue sent out the full solution pdf which I filed away without looking at. After all this time I suddenly had a little thought.....I only ever seem to have little thoughts and I'm used to them not leading anywhere but this time my little thought ended in a "click" and something new happened. Now that was interesting - I went back to the "thingy" and it's "receptacle" and tried all my special little movements all over again to no avail. I played and played and muttered and muttered and eventually effed and blinded before going back to the solution booklet. OMG! Why did I not see that? 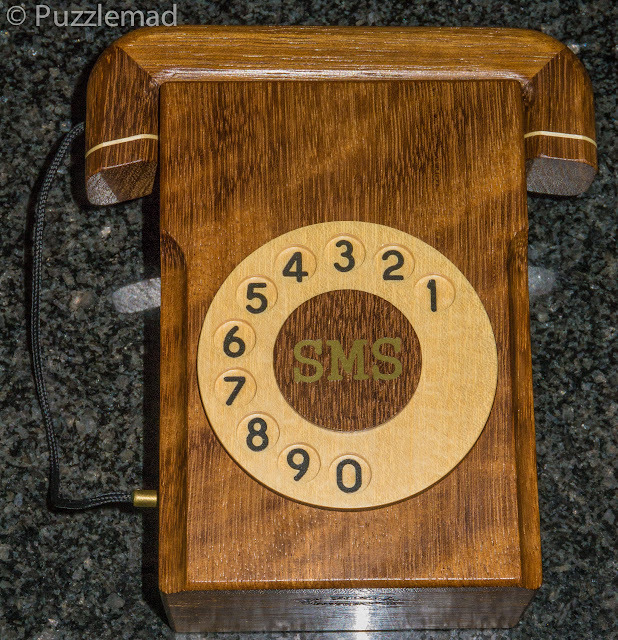 The puzzle was solved and the crazy humour of that mad Aussie was revealed - I could and had received a text message with my wooden phone. Amazing! It's bloody difficult! In fact there are parts that I would never be able to solve myself. It's actually very logical once you know what is happening. It is one of the most epic puzzles of all time even if I couldn't solve it without help on several sections. Christmas is coming and you owe it to yourself and the significant puzzler in your life to get one. I'm sure that you are all much more skilled than I am. The more I do the luckier I get!!! We all know what that means mate! We all know that you are a puzzle designing, making and solving genius! That's a shame Jerry as it is a tremendous puzzle but you've said before that you don't have the ability to keep going on a puzzle for months and months so that is probably for the best. Having said that, the solution is now provided with the puzzle for people who purchase it now. I would like to point out that early on I came to the conclusion that there was no point in waiting to write about this amazing puzzle until after I had solved it - since that was not going to happen! Since then Allard and now you have completed it, fully admitting to using the instruction for part or all of the solve. I agree with everything you say, and would add that using the instructions does not diminish the enjoyment. I understood most of what was required but needed the solution to achieve it - especially that first half! Incredible puzzle, Brian! I heard it's like a revomaze, true? If so, which revo color? It is nothing like a revomaze at all! There's no maze!